Cloud hosting has become popular options for hosting websites and web apps. In contrast to other hosting options (shared, VPS, and dedicated), cloud hosting offers significant benefits in terms of reliability and dependability of the hosting solution. In many cases, cloud hosting is the ideal solution for eCommerce and high-traffic websites. Unlike shared hosting, cloud hosting ensures that the website or the app receives the full complement of the resources that are part of the hosting solution. Similarly, unlike VPS or dedicated hosting solutions, the process of setting up cloud hosting is often simpler and less costly. In practical terms, cloud hosting solutions could be accessed from anywhere with the Internet connection. To make things better, the best type of cloud hosting is managed cloud hosting where the vendor supplying the hosting solution takes care of all hosting related hassles. At the moment, there are a number of managed hosting providers, among which Cloudways stand out because of several benefits. You can easily adjust (scale up or down) the resources and cut the costs of using Cloudways hosting solution. Cloudway allows you to host your website or application on top-of-the-line IaaS partners including AWS, GCE, DIgitalOcean, Vultr and Kyup. Cloudways Platform is ideal for all types of projects, including ecommerce stores powered by WooCommerce and Magento. Cloudways offers 24x7x365 support that is delivered by experts who understand the platform and the hosting challenges for various applications. Cloudways allows users to deploy, monitor and manage high-performance websites and applications. Since the Cloudways platform is optimized for performance, the speed of the hosted websites is second to none! Page load time is an important search signal that determines the position of the website in SERP. Like all top rated PaaS platforms, the user-interface of the Cloudways Platform is geared toward providing the best U for the users. All relevant information is readily available and most of the actions could be performed in minimal clicks. Let’s explore what Cloudways has to offer for website owners, whether they are design agencies, ecommerce stores, web developers, or marketers. Cloudways provides comprehensive support for ecommerce stores. Whether it is a new project or a well-established brand, Cloudways offers one free migration to the Cloudways platform. This means that your ecommerce store could be transferred to the Cloudways managed hosting solution without spending a dime on developers or migration costs. 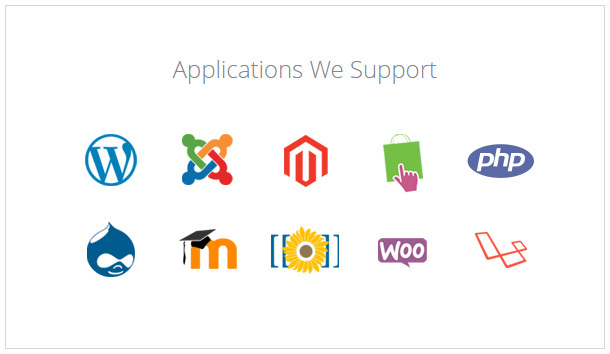 Cloudways supports all major ecommerce solutions including, WooCommerce, Magento and Shopify. The hosting solution for these applications could be launched within minutes and your store is ready for business within a few clicks. Multiple Cloud Infrastructure Providers: These infrastructure providers allow you to host your website or application on DigitalOcean, Vultr, Amazon Web Services, Google Cloud Live Platform and Kyup. Multiple Data Centers: With more than 40 data centers across the world, Cloudways ensures that you do not have to worry about downtime. In addition, you could host your website closest to the target audience, minimizing page load time. Multiple Apps Support: Cloudways supports hosting of PHP-based web apps. In total, Cloudways offers more than 10 app installation options, including vanilla PHP. Dedicated Environment: Every server on Cloudways comes with dedicated resources, including RAM, CPU, bandwidth, and storage. Live Support: Cloudways Customer Team is available 24x7x365 to answer all your queries, including technical and server/application side issues. CloudwaysBot: The smart assistant helps you in optimizing hosted servers and provides real-time performance insights. These insights are delivered through pre-selected communication channels. 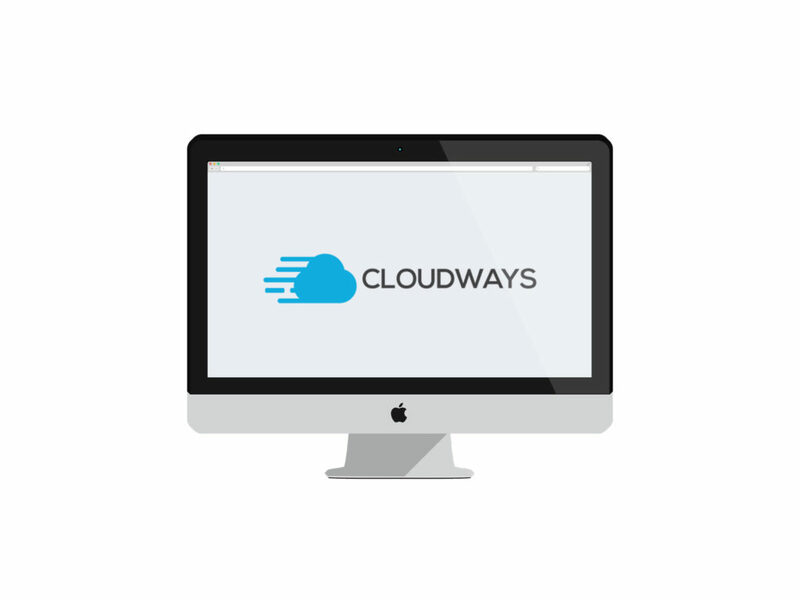 Cloudways API: Cludways API allows developers to integrate Cloudways services without any hassle. When in doubt, the developers have access to PlayGround, where they could try out Cloudways API without any issues. 1-Click Cloning: Tired from copying your website’s content one file at a time? This feature allows you to replicate the entire website in a single-click. 1-Click Backup & Restore: This feature creates a backup that could be restored almost immediately – all in one click. 1-Click Scaling: If you are getting unexpected traffic on your website, then with a single click, you can increase your server size to accommodate the increased traffic. 1-Click Domain Mapping: Cloudways allows you to map your domain with a single-click. 1-Click SSL Certificate: With Cloudways, you can deploy FREE SSL certificates for all your subdomains. Cloudways provides auto-scalability with Kyup. Traffic surges are pretty common, particularly in the case of ecommerce stores. Through Kyup, Cloudways allows the website or store to scale the resources automatically to deal with traffic surges. All servers are protected with platform level firewalls that detect and block all unwanted connections. the Cloudways engineers ensures that all security patches are applied as soon as they are released by the original vendors. Cloudways has integrated two-factor authentication as part of the login process to the platform. HTTP/2 is the latest standard in protecting the communication to and from the websites. This security is further supplemented by FREE SSL certificates by Let’s Encrypt. Cloudways offers state-of-the-art stack solution that emphasizes speed and reliability. 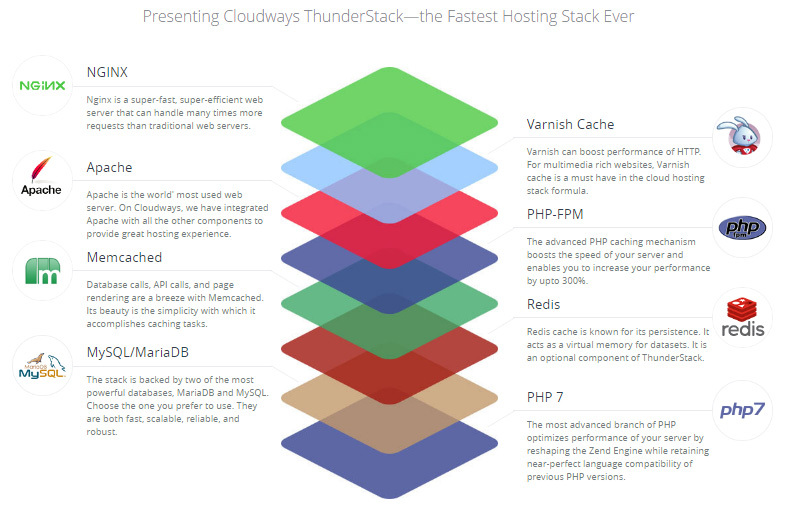 Known as ThunderStack, this recipe comprises of servers (Nginx, Apache), cache (Varnish, Redis, Memcached) and databases (MySQL and MariaDB). These are the applications you can install in 1-click.